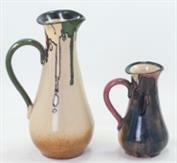 13 (Early Series; PPP) Slender jug, bulbous at base, narrowing upward with flared lip. Two numbered sizes are recorded, the smaller incised 13/5 or just just 13, the larger 13/7. Other sizes are also recorded, but un-numbered. Bases stamped PPP, incised 13. Long Gone Antiques, Warrnambool, Vic. Two sizes are recorded, with suffixes s and L.
These may have been intended for use either as candlesticks or as lamp bases. Note the hole for an electric cord. For another such dual-purpose piece see Early Series 157. It is not clear whether 13 is a re-allocation of an Early Series number that became vacant when the PPP name ceased in 1934, or is part of a separate little 'Animal' numbering series. It is one of a series of animal-decorated shapes that all feature a wide flaring foot and become narrower upwards. See Early Series 4 ; 5 ; 7 ; 9 . Koalas attributed to John Castle-Harris. Un-numbered, shape somewhat different. Height; 13.5 cm. : The second no.13 shape may be a re-allocation of an Early Series number after it became disused with cessation of PPP production in 1934, or it may be part of a separate small 'Animal' numbering series. Height; 12 - 12.5 cm. Height; 18.5 - 19.5 cm. Bases stamped PPP, incised 13/7.